Mckenzie Lacroix: Suge Knight & Kat Williams Arrested!! 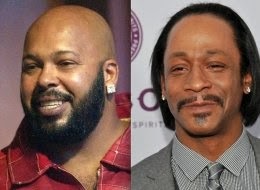 Suge Knight & Kat Williams Arrested!! Hip-hop mogul Marion "Suge" Knight and comedian Micah "Katt" Williams have been arrested for allegedly stealing a camera from a celebrity photographer. The Los Angeles County district attorney's office charged both men on Wednesday with one count of robbery for allegedly taking a camera from a woman outside a Beverly Hills studio on September 5. Knight, the co-founder of Death Row Records, faces life in prison because of a previous conviction for assault with a deadly weapon, KVVU reports. The Associated Press reports that the charge carries a possible 30-year sentence for Knight. Williams was busted when he showed up for court, according to TMZ. He was appearing in Inglewood on an unrelated assault charge and could be locked up for seven years. Bail was set for Knight at $1 million and $75,000 for Williams, according to NBC Southern California.